As new car manufacturers move towards smaller lighter components such as power steering pumps the need for “Reduced Friction” steering parts increases. 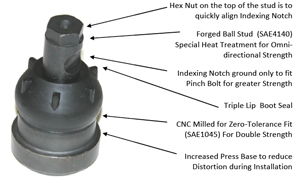 We design many features to give us the most ‘Reduced Friction” parts on the market. This all adds up to smoother steering, better handling and increased fuel efficiency. XRF steering Parts are built like anti-friction bearings with very close tolerances and highly polished studs and bearings. XRF protective boots are made of “CR” compound rubber that is resistant to gasoline, oil, brake fluid, battery acid and road-level ozone. 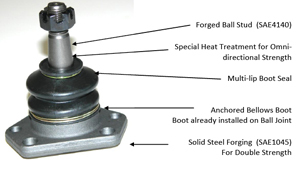 The boots are also anchored to the housing to ensure a tight seal and easy installation. The boots seal around the stud with a multi-lip seal. No other manufacturer gives you this kind of protection against contamination and loss of lubricant. On components with a high amplitude stud swings, XRF uses accordian style boots that are anchored at the base and multi-lip sealed at the stud to ensure that the boot will follow the stud for a positive seal. We use a very expensive step thread on all of our Ball Studs and nuts. This is a matched thread that allows the installer to spin the nut on by hand but when when tourqued it provides the strongest thread available. At XRF we pre-tap all Grease Zerk housings plus supply you with straight, 45 degree and 90 degree Grease Zerks to fit every application. This means no fuss with self tappers and no contaminants into the heart of the part. Each XRF Ball joint comes prepacked with high quality molybdenum disulfide grease. 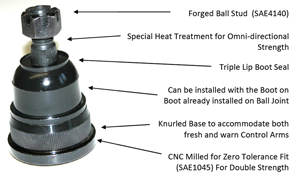 In order to achieve XRF’s demand for “Extreme Duty” parts, XRF has replaced all conventional metal stamping ball joint housings with heavy duty hot forged housings that allow us to increase the bearing area and double the stud pull-out strength. Our competitors generally use SAE 4118 mild steel (.17 carbon). XRF uses SAE1045 or SAE 4140 mid carbon steel (.43 carbon). Our competitors use mild steel because it is inexpensive and easy to work with. XRF uses mid-carbon steel for strength and heat treats for durability to produce a very robust long-life component. XRF uses Computer Numerically Controlled (CNC) milling equipment to make our parts dimensionally perfect. Every XRF part is made exactly to specifications with “Zero Tolerance ” variations. Our competitors cold forge their housings and allow large tolerances +/- .008″ for die wear allowing the possibility of having some part fit too tightly and others to fit too loosely at the press fit diameter. There is never a complaint that XRF ball joints are too tight or too loose in the control arm. Don’t take our word for it. We have our parts independently benchmark tested against the best of our competitors at a variety of test centers in Canada and the USA. Our independent testing guarantees that XRF parts will out-perform the competition. All of our manufacturing procedures are monitored and verified each step of the way by our sophisticated system of “Statistical Process Control” (SPC). Each part as it is being manufactured is checked either physically or electronically for specification conformity.